"Traditional scale? Stablemate scale? 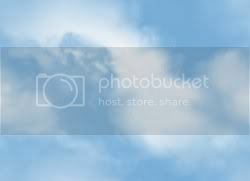 What does it all mean?" The most common scale terms in the hobby are (largest to smallest) Traditional, Classic, Littlebit and Stablemate. These terms all originated with the Breyer company, but are now in general use to refer to any model in one of those four scales. The Peter Stone company has its own designations for Littlebit (Pebbles) and Stablemate (Chips). 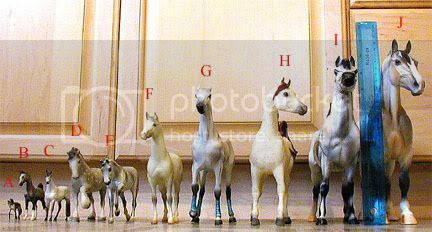 There is a fifth scale group smaller than Stablemate, usually referred to as Micro Mini, but Breyer uses "Minnie Whinnies." Most Hartland models do not fit the common scale groups. Their Regal/11 inch series is usually larger than Traditional, 9 inch series is between Classic and Traditional, 7 inch series is roughly Classic, 5 inch series is roughly Littlebit and Tinymite series is roughly Stablemate. Most other model horses fall into one of the four main categories, with the exception of Hagen-Renakers. "DW" or Designer's Workshop series models run from Classic up to larger than Traditional scale, while the Specialty and Mini series horses are Littlebit scale or smaller. They also have three older horse molds originally labeled "Mini Mini" (about Micro mini scale). Below, left to right, are some of the common scales of model horses, shown next to a standard 12 inch ruler. Please also keep in mind that within a scale group, models can still vary widely in size and may not be in perfect scale to each other. Scale designations are just a rough estimate of size.